A Tale of Two Cities (1859), Dickens' greatest historical novel, traces the private lives of a group of people caught up in the cataclysm of the French Revolution and the Terror. Dickens based his historical detail on Carlyle's great work - The French Revolution. 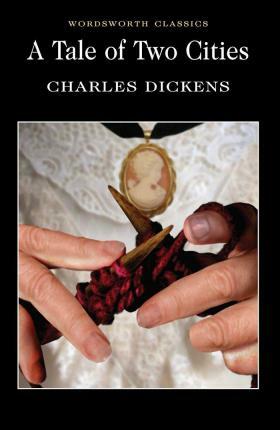 `The best story I have written' was Dickens' own verdict on A Tale of Two Cities, and the reader is unlikely to disagree with this judgement of a story which combines historical fact with the author's unsurpassed genius for poignant tales of human suffering, self-sacrifice, and redemption. A Tale of Two Cities is Charles Dickens's great historical novel, set against the French Revolution. The most famous and perhaps the most popular of his works, it compresses an event of immense complexity to the scale of a family history, with a cast of characters that includes a bloodthirsty ogress and an antihero as believably flawed as any in modern fiction. Though the least typical of the author's novels, A Tale of Two Cities still underscores many of his enduring themes - imprisonment, injustice, and social anarchy, resurrection and the renunciation that fosters renewal.